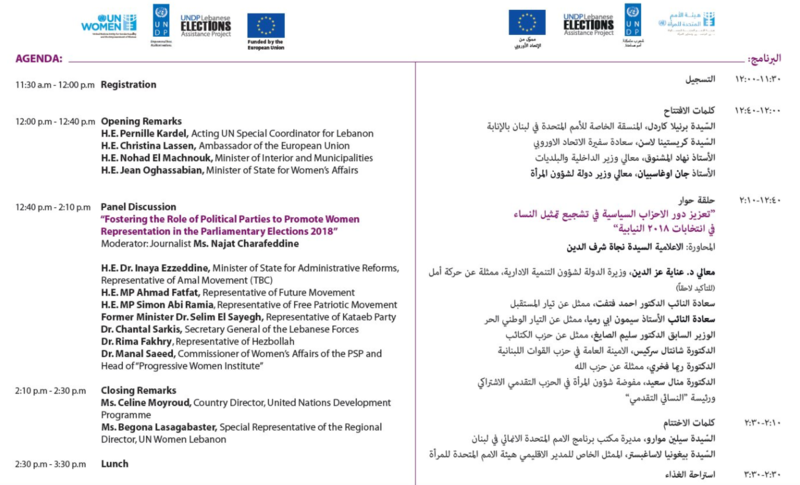 The Office of the Minister of State for Women’s Affairs (OMSWA) and the United Nations in Lebanon are organizing a conference on the role of political parties in promoting women participation in the parliamentary elections on Wednesday, 17 January at 12:00 pm at the Kempinski Hotel in Beirut. Held under the patronage of Prime Minister Saad Hariri, the conference is entitled “Fostering the role of political parties to promote womens representation in the upcoming Parliamentary elections 2018”. It opens with remarks by the Minister of State for Women’s Affairs Jean Ogassapian, the Minister of Interior and Municipalities Nohad Machnouk, the UN’s Acting Special Coordinator for Lebanon Pernille Kardel and the EU Ambassador to Lebanon Christina Lassen. The event includes a roundtable discussion with representatives from seven political parties represented in the Lebanese Parliament. In addition, a proposed roadmap to enhance the effective and meaningful participation of women in the elections will be launched that brings together the Office of the Minister of State for Women Affairs, UNDP and UN Women. Noting the low percentage of women representation in the Lebanese parliament since they were granted the right to vote in 1952, the objective of the event will be to emphasize the importance of political parties including women candidates on their electoral lists for effective and inclusive participation in the elections. All members of the media are kindly invited to attend and cover the event. Find the agenda in the attachments below. Mona El-Yassir mona.el-yassir@undp.org ; Cynthia Khoury khouryc@un.org.